The redesigned MicroTrack II brings even more professional features to the original high-fidelity mobile digital recorder that’s been popular in professional field recording, the recording of corporate meetings, and in training, education and worship. With an extended input gain range, analogue input limiter, 48V phantom power, faster file transfer rate and other enhancements, MicroTrack II delivers a high quality mobile recording experience. Simply record WAV (BWF) and MP3 files to CompactFlash or Microdrives through balanced line inputs or built-in microphone preamps - then drag and drop recordings to your computer via high-speed USB 2.0 for immediate editing or Web posting. Power is derived from a lithium-ion battery, and the unit can recharge via the computer’s USB connection or USB power adapter. 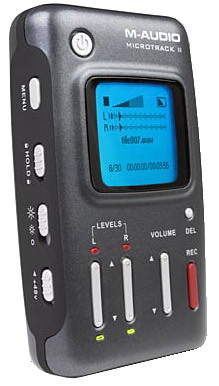 The MicroTrack II's ability to record directly to MP3 files and transfer them instantly to the computer means that you can e-mail or post high-quality recordings to the web immediately. Musicians can e-mail demos to writing/production partners and record companies when the inspiration strikes. Business users can easily upload meetings and presentations for review and wider dissemination immediately. Educators can post classes, lectures and seminars without delay. Faith-based organizations can quickly broadcast worship services and speakers. Professional presenters can create and sell their content almost instantly. One of the secrets to the MicroTrack II’s compact size is that, like many of today’s digital cameras, it records to CompactFlash or microdrives. 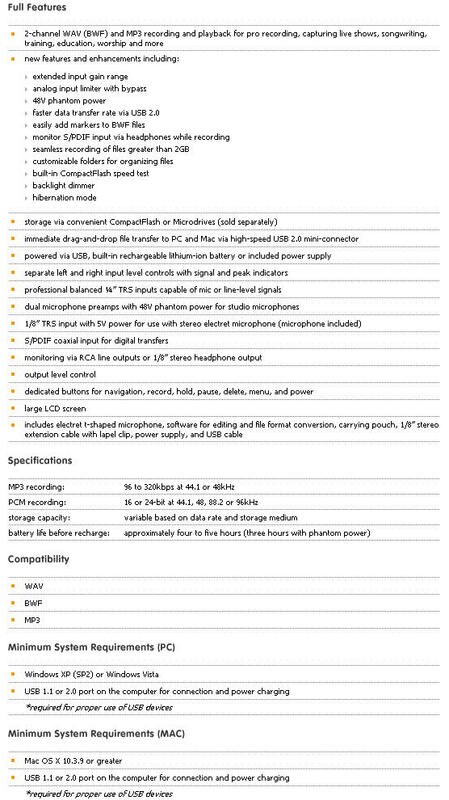 Recording capacity is based on the recording format selected and the size of the currently inserted media. An affordable upgrade to a 1GB CompactFlash card or microdrive, for example, will hold approximately 100 minutes of uncompressed CD-quality 16-bit stereo 44.1kHz WAV files. That same 1GB media will store 1500 minutes of stereo speech-quality MP3 audio at 96kbps. Of course, you can use and swap out whatever capacity media suits your needs. You can record as many unique files as the capacity of your available storage allows. Then just connect MicroTrack II to your PC or Mac via USB, and it appears as a USB mass storage device showing the unique identification number of each file. Just drag and drop the files to your computer’s hard drive and your audio is ready to edit and/or post to the Web. The included Audacity software even gives you the power to easily edit your files and convert between file formats. MicroTrack II is powered its in-built long-life lithium-ion batteries. You can record for 4-5 hours on a single charge (or about three hours with phantom power engaged), and playback for around 7 hours. Recharge the battery by simply connecting MicroTrack to a PC or Mac via USB, or using the power supply. Note that this recorder cannot be powered simply by adding a couple of AA batteries like most of the other recorders we offer at this price point. At about the size and weight of a deck of cards, MicroTrack II will go anywhere you need to record—but don’t let its small size fool you. Thanks to leaps in miniaturization, this rugged device is in the same class as major brand digital cameras. MicroTrack II's mobility and internal mic preamps also make it ideal for recording practice sessions and gigs, not to mention capturing film-quality sound effects in the field. Balanced ¼” TRS mic/line inputs also make it easy to record from professional microphones or take a feed directly from a studio or club mixer. S/PDIF input means that you can even record the output of digital mixers and do transfers from other digital recording/storage devices. 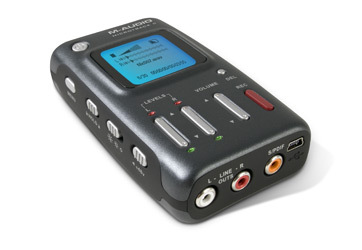 And regardless of how you choose to record, you can monitor via the 1/8” stereo headphone jack or RCA line outs. The MicroTrack II represents a far better way to acquire audio than DAT or MD, especially in the field. For starters, MicroTrack II's media and electronics are all solid state, making them significantly more compact, reliable and resilient. Where delicate DAT tapes and MD discs are getting harder to find, CompactFlash and microdrives are readily available, and the price per megabyte keeps plummeting. Perhaps even more compelling, audio data transfers from MicroTrack to your computer almost instantly - no more waiting around for real-time DAT or MD transfers. And MicroTrack II's media can even double as storage for other devices such as digital cameras.